The new instrument is used to assess and monitor the relative moisture level of materials including plaster, masonry, concrete and fibreglass (GRP). 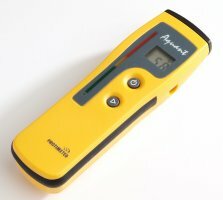 It is ideal for checking the relative moisture condition of building elements such as solid walls and floors prior to more rigorous and time-consuming investigative procedures that may be required. Leak paths in shower cubicles (behind ceramic tiles), in caravans/motor homes and mobile homes can be identified with the Aquant before visible water damage occurs. Also, this instrument may be used for surveying GRP boat hulls for the early detection of damp spots that could lead to blistering caused by osmosis. The Aquant has a digital display that is synchronised with a colour coded LED scale. The display shows the relative moisture level of the material under investigation on a scale of 0-1000 and the colour coded LED scale indicates the material’s moisture condition. To use, the Aquant is simply held against the surface of the material under investigation as shown. The relative moisture level is measured by radio frequency to a nominal depth of 10-20mm. There are no needles to mark the surface.